Firstly, the dentist establishes with you a comprehensive oral evaluation to see if a tooth needs to be replaced. The dentist may take an X-ray examination or use a 3D dental scanner strong>Cone Beam type. A prosthetic and surgical treatment plan is then given to you at the end of this examination. Next, the implant is placed in the jaw under local anesthesia. 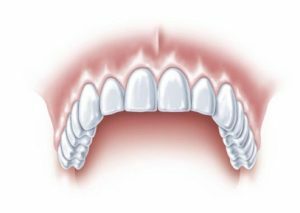 A temporary prosthesis is placed so as not to remain edentulous: crown or adhesive bridge, removable or partial prosthesis. Depending on the clinical situation, the osseointegration period varies from 3 to 6 months in which the bone forms around the implant. After an osseointegration check and the healing of the dental implant, this is the last step of the treatment. A dental impression is taken in order to fabricate the final dental crown which is subsequently fixed on the implant. You can choose a biocompatible all-ceramic crown which will look much prettier than a metal-ceramic one. Eventually, you find the appearance and comfort of a natural tooth with an unchanged mastication. The beauty of your smile is restored. 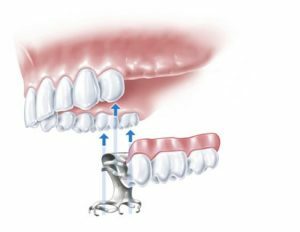 Comparison of possible prosthetic solutions for a missing tooth. 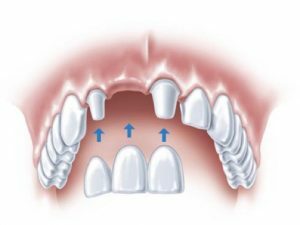 The adjacent teeth of the missing tooth are prepared for the bridge to be fixed. 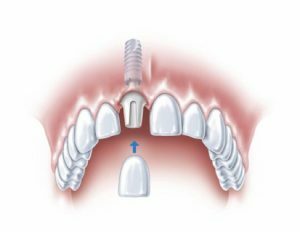 The placed implant hosts a permanently attached crown that takes on the appearance of a natural tooth. The adjacent teeth are preserved. As a preliminary step, the dentist establishes with you a comprehensive oral evaluation. The dentist may take an X-ray examination or use a 3D dental scanner Cone Beam type. CôneBeam. 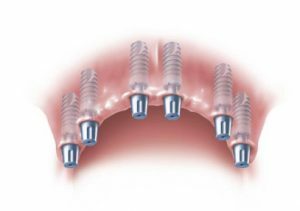 Secondly, the implants are placed in the jaw under local anesthesia. 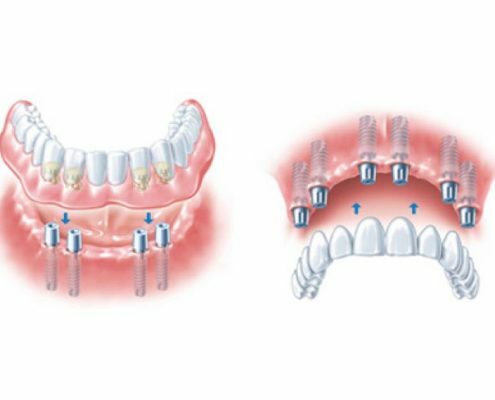 A temporary prosthesis can be placed so as not to remain edentulous: Adhesive bridge, removable or partial prosthesis. 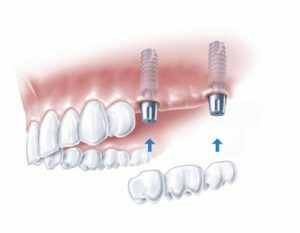 Depending on the clinical situation, a period of osseointegration varies from 3 to 6 months in which the bone forms around the implants. After an osseointegration check and the healing of the dental implants, this is the last step of the treatment. A dental impression is taken in order to fabricate the final ceramic bridge which is subsequently fixed on the implants. 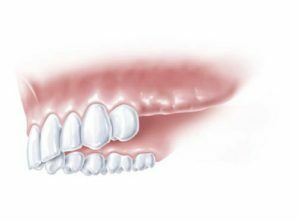 You can choose a biocompatible all-ceramic bridge which will look much prettier than a metal-ceramic one. Eventually, you find the appearance and comfort of your natural teeth with an unchanged mastication. The aesthetic of your smile is restored. 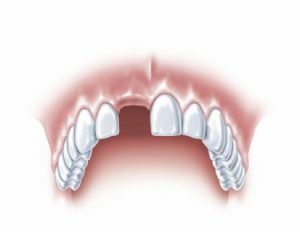 Comparison of possible prosthetic solutions for several missing teeth. The prosthesis is held by clasps fixed onto the supporting teeth which may weaken them. There is a risk of mobility and visibility of the prosthesis. 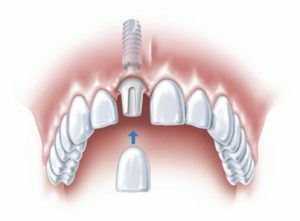 The implants accommodate the bridge, which looks similar to natural teeth. The bone volume is preserved with an unchanged mastication. 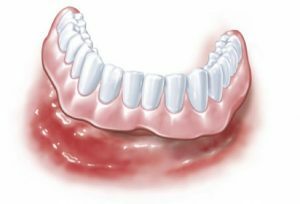 For a long time the removable prosthesis was the only treatment possible for people who had lost all their teeth. There were no fixed solutions. 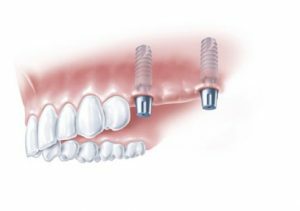 Thanks to dental implant, it is now possible to replace all teeth: This is the complete bridge on implant. It allows to avoid the removable, mobile and uncomfortable prosthesis. The dentist establishes with you a comprehensive oral evaluation. The dentist may take an X-ray examination or use a 3D dental scanner Cone Beam type. 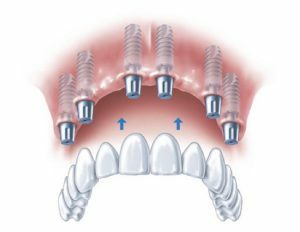 The implants are placed in the jaw under local anesthesia. 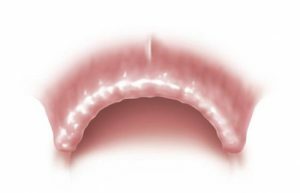 A temporary prosthesis can be placed so as not to remain edentulous: Adhesive bridge, removable or partial prosthesis. Depending on the clinical situation, the osseointegration period varies from 3 to 6 months in which the bone forms around the implants. 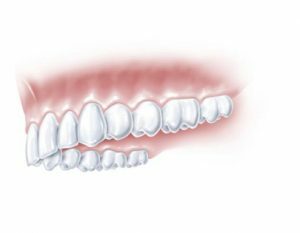 An impression is taken in order to fabricate a definitive ceramic bridge which is subsequently fixed on the implants. You find the appearance and comfort of a natural tooth with an unchanged mastication. The beauty of your smile is restored. The removable prosthesis is stabilized by the mucous retention: This could have an annoying impact over the masticatory aspect. The bone capital will decrease over time. The prosthesis is stable. The aesthetic and masticatory functions are optimal along with a preserved bone volume. 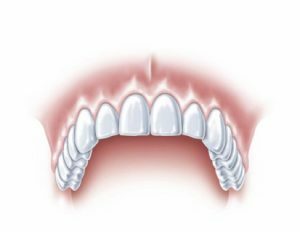 Learn more about replacing one or several teeth, or all damaged or missing teeth, as well as our experience with dental implant.